So Shay: Our Christmas Card. I wish I had time right now to show you all the outtakes from this Christmas Card photo shoot we had smack dad in the middle of our living room. However, I'm pressed for time and have to leave for Christmas festivities with my families. Until then...here is the BEST shot (haha) we took and used for our Christmas cards. yall are adorable. I LOVE IT! Ohh myyy gosh. Love LOVE love this. haha, so cute! i love it. This is adorable! Merry Christmas! 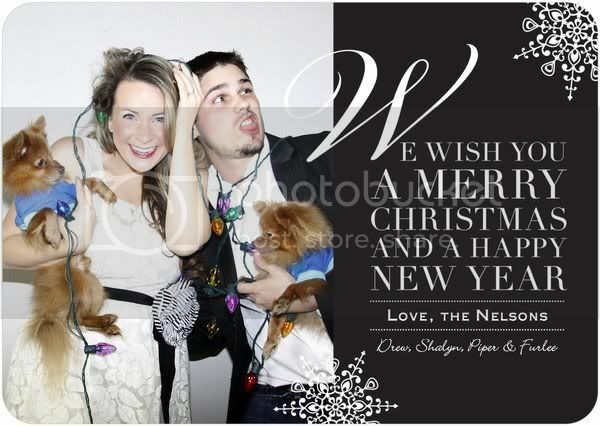 Love the Christmas card, so cute! You all are adorable!!! Merry Christmas to you all! I love it, Shay! Fits you guys perfectly! you are so talented miss shay! this is an adorable card. merry christmas! They turned out very cute! Merry Christmas!